01/09/2012 - The first race of Imola’s weekend did not finish at the chequered flag, as Riccardo Agostini crossed it in first position, but the victory was put in Henrique Martins’ hands after the technical verifications at the end of the race when the car of JD Motorsport’s driver was deemed not complying the regulations. At the start Maisano took his team mate Eddie Cheever, who started from the pole, but he did not manage to pull away and at the Villeneuve chicane the Roman made a move on the French pupil of Ferrari Driver Academy. The contact was unavoidable and the driver from Padova in the ranks of JD Motorsports got the most of the situation to get the lead of the race that he afterwards kept until the chequered flag. During the third lap Martins managed to overtake his team mate Maisano who had his front wing damaged after the contact with Cheever. Mario Marasca also tried to take the Frenchman but had to give up to the moves by Eddie Cheever. Lap four saw the exit of two Italians that touched each other at Villeneuve and had to stop their race right there. Maisano was forced to get back into the pits after he was black flagged due to a problem to the front wing. At the flag Agostini triumphed ahead of Henrique Martins,while Kevin Giovesi managed to keep Sergey Sirotkin at his back and to obtain the second podium of the season after the one harvested at Red Bull Ring, but the cold shower for Agostini arrived a few hours after the end of the race. His car was found not complying the technical regulations and the podium was therefore turned upside down with Martins on the top step, followed by Giovesi and Sirotkin. 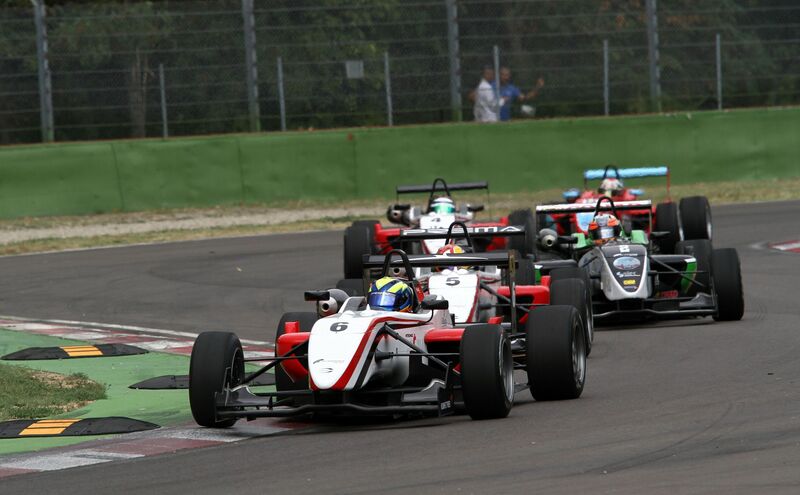 Fourth position for the very good Nicholas Latifi, on the second Mygale belonging to JD Motorsport. The Canadian tried to pass the Moscow driver of Euronova for the third position but had to contempt himself with the fourth position. Fifth was the South African driving for Victoria World, Roman De Beer who is improving race by race. Very good performance also for the rookie Jakub Dalewski, at his first experience on the Dallara of team Ghinzani who will start tomorrow from the pole position as he finished race one in sixth position. Seventh was Yoshitaka Kuroda, who started from the pits due to a problem to the rear right tyre. Eighth was Brandon Maisano who got back on track after replacing the nose of his car and ended his race harvesting important points for the classification. The second race of the weekend will start tomorrow morning at 10.00 (GMT+2), live TV coverage on Rai Sport 2, with Riccardo Agostini starting from the pole that will be required to keep at bay all his rivals for the thirty minutes plus a lap of the race. The sprint race will have green flags at 18.00 and will be broadcast recoreded on Rai Sport 2 at 18.55.